This ice cream is defined as ice cream by me even though it’s actually kind of secretly NOT ice cream. But I mean that in the best possible way, if there even is such a thing as non-ice cream being a best possible ice cream thing. You might not even realize that the non-ice cream is actually not real ice cream because the texture (even though it’s just frozen bananers) is just. like. ice cream. What is going on. 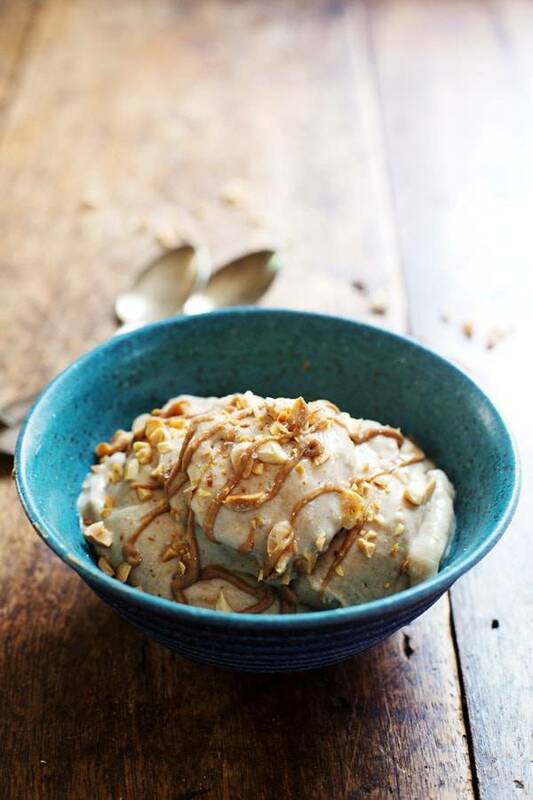 This whole yummy thing is just sweet, ripe frozen bananas that have been smoothed out in the blender and then laced with a little vanilla, a little cinnamon, and a good dollop of peanut butter creaminess. And this whole yummy thing is also my complete meal replacement plan for the next long time because peanut-butter-banana has control of my miiind. As a general food lovers’ rule, I try to eat more of the foods that I really like. Namely dark chocolate, melty-cheesy Mexican food, pasta with so much extra sauce that you can’t even stand it, and Pad Thai slash curry. But that being said, there’s one beloved food I’ve been trying to eat less of and its name is shugrrr. We talked about that when I started to be Granola-person by putting DATES (the brown wrinkled ones? yes) in my four-ingredient green smoothies. Oh my gosh, just typing that out is some kind of self realization scary. Things are start to get a lee-tle weird around here, says the normal half of my brain. Recently my sister and Pinterest told me that this banana ice cream trick is a really good one, so today I’d like to report back on the results of this creamy banana dessert-ness. Verdict is —> TWO THUMBS UP. How in the heck does this even happen? I seriously cannot believe that bananas alone can create this creamification that rivals the beauty of ice cream. It is magic and fireworks and love at first *bite. * Had to. I’m really into almond butter at the moment and during one of the millions of times that I’ve made this in the last few days I accidentally used almond butter instead of peanut butter. Mmk now. Being a major fan of almond butter, I feel very confident speaking the truth in love: this recipe is simply not as good without that rockin’ P-B. Peanut butter and banana are lovers that should not be separated. Don’t mess. And if you are reading my mind (or maybe I’m reading yours?) you’ll know that this begs for a sprinkle of coarse sea salt. You guys. I don’t know why but just YES. And now I’d like to officially welcome you to the World of Weirdly Delicious Recipes That Qualify as Both Breakfast and Dessert. ONE LAST THING. This ice cream requires a heavy duty blender. Garage sale freebies are probably a no-go for this recipe (and yes, I do have one of those, too). I always have the best results with my Blendtec Designer Series Blender. If you’re in the market for a new grown up blender, this has your name all over it. 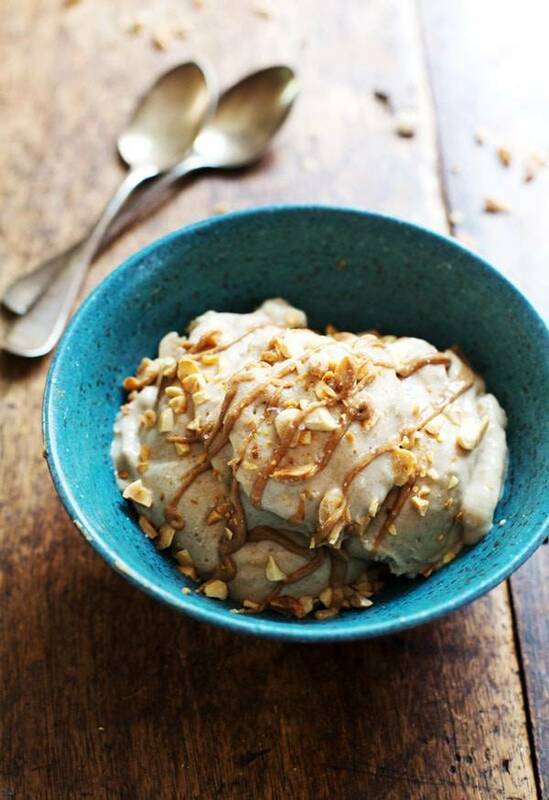 This dreamy Peanut Butter Banana Ice Cream is naturally sweet with just bananas, peanut butter, vanilla, and cinnamon. 300 calories. YUM! Cut the bananas into small chunks and freeze until solid, at least 1-2 hours. Transfer the bananas to a very strong blender and blend until smooth and creamy. This will take a few minutes and may require periodic pauses and adjustments. It’s very loud and intense since the bananas are frozen, similar to adding ice cubes to a blender. Within a few minutes, you should be seeing a thick, creamy ice-creamy mixture in the blender. Add the peanut butter, vanilla extract, cinnamon, sea salt, and anything else you might like in there. Pulse the blender quickly to stir the ingredients all together and when everything is mixed, serve immediately. Top with additional peanut butter and crushed roasted peanuts. You can put this back in the freezer to eat part of it later, but the consistency loses some of its wonderful velvety-ness when you re-freeze it, so just eat the whole thing now. I command it. If you absolutely must exercise self control and save the rest for later, running it through the blender again before serving might help. The texture of the frozen bananas is amazing, its hard to believe its not a cream based ice-cream. 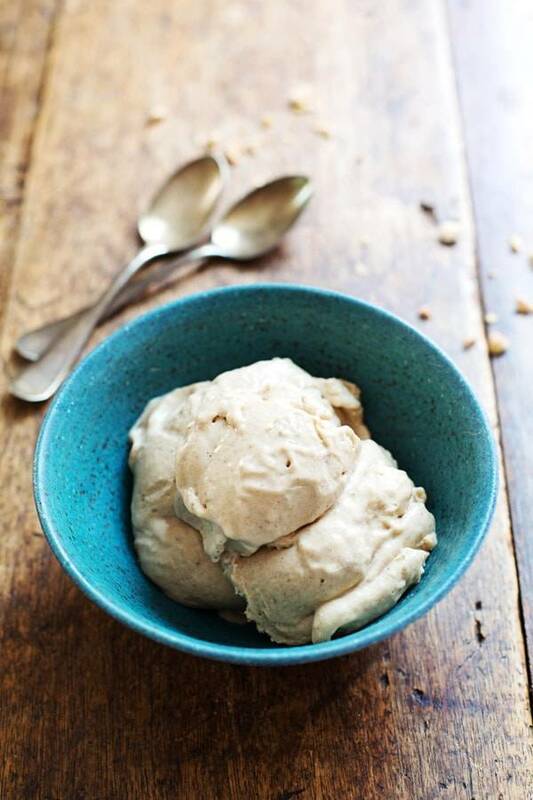 Yep, I’ve probably ranged about the amazingness of banana ice cream far too many times on my blog to be healthy…since I was diagnosed with celiac disease, I haven’t been able to find a processed gluten free/dairy free ice cream that doesn’t upset my tummy. Banana nice cream is my savior and I usually have it at least one time a day! My favorite add ins? Sunflower butter, protein powder, cacoa, spinach, apples and berries! So many yummy options!! banana ice cream is my fave! LOVE this stuff so much! Whoa, this ice cream is amazing, Lindsay! Ice cream is one of the best things ever but lactose and I rarely get along so I can’t eat ice cream all the time. But your recipe solves the problem! Thanks for sharing and hope you have a great weekend! What a clever idea. BUT even though it’s not ice cream, it looks like ice cream to me. I suspect it tastes like ice cream. Sooooooo when I pinned it, I had to pin it on my ice cream board! Truly a wonderful twist for a dessert. Great idea with the strawberries! When I was 12 my best friend Lori Allen had horses and I used to go over there all the time. After riding horses we always ate banana nut ice cream. Love the addition of peanut butter. Happy week-end! Yep – get more bananas in there! I have tried this before in my food processor and it worked great! 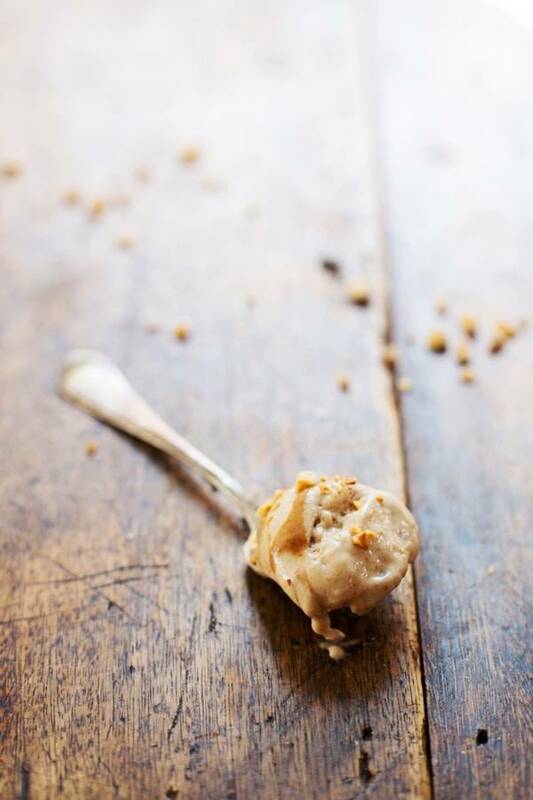 We experimented with lots of different flavors, but not peanut butter. Will have to try this tomorrow night. Thanks for the idea! I wonder how it would be with chocolate chips. Our favorite flavor was strawberries, but I have a feeling this one may take the cake. Thanks, again, for the inspiration! Ooh I like the strawberry idea! Wow Lindsay! This looks delicious!! I’ve heard about this recipe too but have never gotten around to making it. Love your photos, by the way. Were these shot in daylight or artificial light? They look gorgeous! *heart eye emoji x 23213* 🙂 🙂 ohmygoshyum. I’ve heard so much about banana “ice cream” I still haven’t tried it. And that’s great about the $3 garage sale blender. So true. I’m moving later this month and I thiiink I’m goign to treat myself to a Vitamix!! Holy moly! I tried this recipe tonight and it is seriously delicious. I plan on eating this at least once a week. Thank you, Lindsay! Ice cream success! 🙂 Thanks Jane! This is one of my favorite things to make since I turned to all clean eating! I use Trader Joe’s almond butter and mix with frozen bananas! It’s seriously brilliant… and so ice cream like! Your photos are gorgeous, as always! I’ve seen this before somewhere and now you’ve just reminded me that I haven’t tried it yet. I’m thinking of all kinds of possibilities like nutella (& pb as well as it comes so highly recommended – why not?) Great idea! I remember the first time I used frozen bananas to make “ice cream” and it was the most amazing thing!! 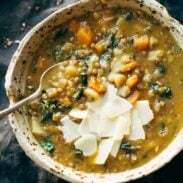 I will definitely have to try out this recipe as it looks amazing! Holy shizzle, this flavour combo is insaaaaane! Trying this immediately – love how easy it is! One of my favorite guilt free treats. I make this all the time! Perfection in a bowl! This looks so creamy and so amazing. Plus peanut butter – enough said! This is true! 🙂 Bjork and I are just experimenting with eating less processed and added sugar, and more natural sweeteners for a period of time… we both felt like we were needing a bit of a change from all the added sugar in not only desserts (I LOVE DESSERTS) but also just snacks, drinks, and convenience foods. So I’m really excited to report back when our experiment is up and we actually have more concrete and helpful experiences to share! 🙂 stay tuned! Genius! I love this. I love the marriage of peanut butter and bananas. So true that those two should not be separated. I totally thought this was going to be a “REAL ice cream” recipe and it was just another reminder that I haven’t gotten a mini ice cream maker yet. But I love that it’s not technically a real ice cream. I can totally make this since I do have a blender. Awesome! Love this tip – thanks D’Ann! 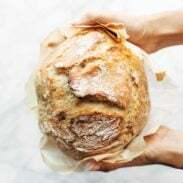 My friend just shared this recipe today and I just finished making it. Tastes so decadent. Love it. Used natural PB and a generous sprinkle of salt. Thanks for the new summer treat! so fun! Thanks for the comment Susan!